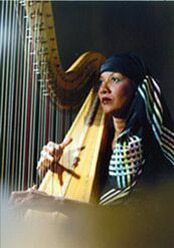 A contemporary harpist and singer, Onita Sanders is a visual and aural delight. Her vast and eclectic repertoire, is expertly performed either on a ebony, blond, gold, or folk harp. From 2 (for a romantic dinner) to 2000 (for a museum holiday party) all have been enthralled by her music on the acoustic to acoustic-electronic harp. Her tasteful handling of rhythm and special-effects, can make her sound like a trio. Whether it is 150 feet in the air at a marina or in the largest hall, amplification is always available for herself as well as the client. Her love for playing in or outdoors, her engaging personality, her beautiful and embracing lyric voice, all combine to make her a favorite with those who have been charmed by her music. Onita Sanders graduated from Cass Technical High School. She received a B.S. in Education from Wayne State University. 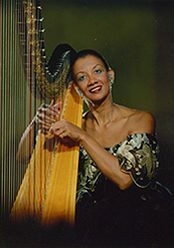 Onita has received formal training in harp from Velma Froude and Harvi Griffin, voice from Celeste Cole and Avery Crew, piano from Julius Chajas and Albert Filmore, and jazz from Bess Bonnier and Matt Michaels. An accomplished musician, Onita is listed as a Performing Educator with Wolf Trap Early Education, Omniarts in Education, and Young Audiences of Michigan. Onita has been honored as one of the outstanding women in music by the Top Ladies of Distinction Organization. She has performed for various events including Kalamazoo New Years Fest, Pinecrest Children’s Concert Series, and the Black History Celebration at Nothwood University & Mott Community College. 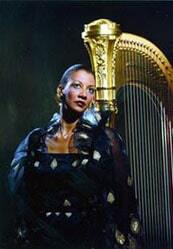 Onita is the featured Harpist for Aretha Franklin’s “I’ll Fly Away” on Arista Records Tribute to Princess Diana. Onita’s vast repertoire is constantly being enlarged. A sample list and Demo CD is available upon request. Hi Dean! Our harpist was delightful! It was the perfect touch to our lovely evening for our Dental Staff Harpist for Employee Christmas party Coach Insignia Restaurant – Detroit We look forward to using your service in the future. .. Thank you. Thank you for your wonderful talent and beautiful harp playing. Our guest commented to us how great you were. Thank you for making our wedding as perfect as we wanted. Everyone thoroughly enjoyed your performance during the Cancer Survivors’ Celebration. Your rendition of ‘Danny Boy’…and the vocal accompaniment…well, I needed to repair my mascara.